102nd day of the year. There were then 263 days left in 2019. 24th day of Spring. There were 71 days left till Summer. April 12, 2019 was the 38th day of Lent (Christian Observance). don’t let the demons take away your joy. celebrate life. 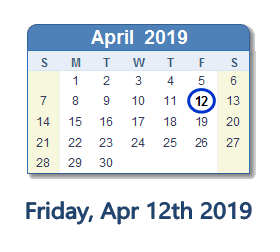 What happened on April 12th 2019?